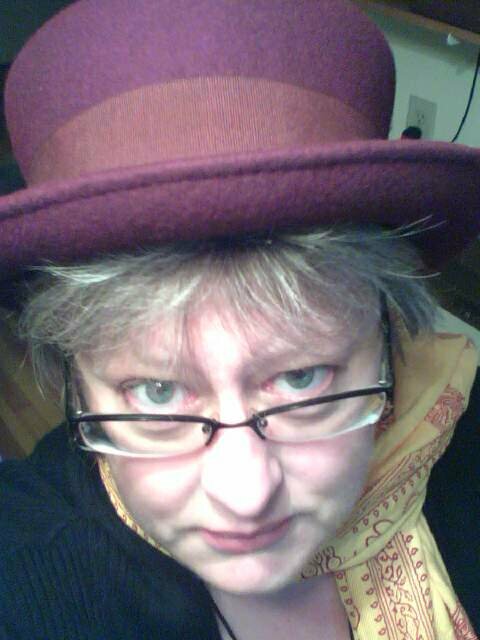 Only one hat will do today: it’s the Mad Hatter! During one visit to Adrean in Brussels, I kept walking past the shop window where this hat was displayed and I kept thinking, “Oh, it’s too expensive.” Then I thought, “You’re going to regret not getting that hat. What if you never come back to Brussels?” So I got the hat — but I’ve been back to Brussels many times. It’s supposed to be about 17 degrees today. The hat’s not just stylish, but necessary. I have to go grade my sophomores’ final presentations on medieval drama, then grade the upper div papers while listening to the Punk Rock Jukebox, then meet pals at the Albany Pump Station. Sounds like a good day, eh? i didn't know you had a blog. How did I miss that? And it's a wombat too. Love the hat! Sounds like a fab day to me! I will drink a hearty glass of Zubrowka in your honor this evening….Card and prezzies on Saturday for you! Yay!! Mmmm, Zubrowka! Can't wait for Saturday — although tonight will be much fun, too!